About 75 people, including 29 members of the Proctor Military Kids Club, attended the morning ceremony April 5, 2018. 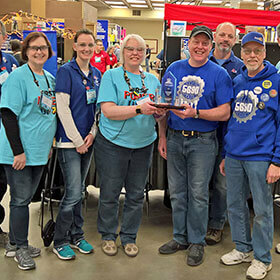 As 120 teams competed at two FIRST Robotics regional tournaments, organizers recognized Minnesota Power as the Volunteer of the Year. 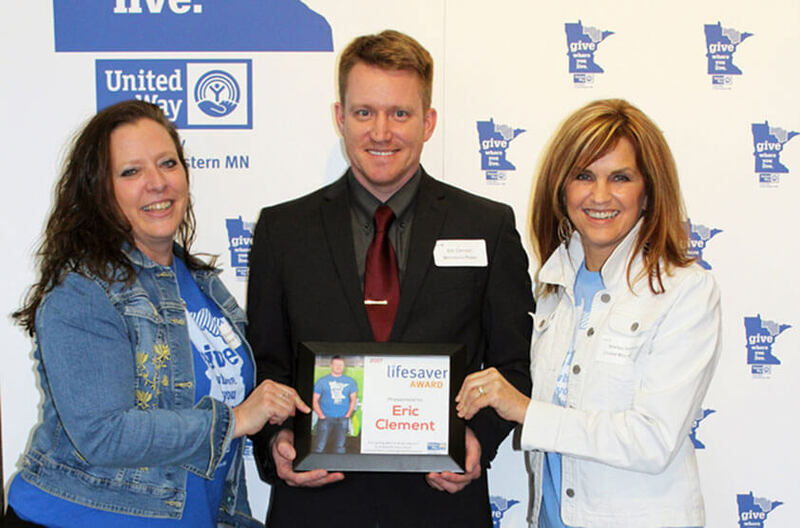 Eric Clement received the Lifesaver Award for the time and dedication he gives to the organization. Hibbing High School’s ornate auditorium is legendary on the Iron Range—both for its elegance and its historic significance. Balancing military service with a civilian job is not easy, but a supportive employer can make a big difference. When one door closes another opens. That old saying is true in Chisholm, where a former Minnesota Power service center is now home to United Way of Northeastern Minnesota. A historic hurricane season that battered Gulf Coast states and Puerto Rico called utilities across the country into action, including Minnesota Power and Superior Water, Light & Power (SWL&P). The University of Wisconsin-Superior has always been part of Steve DeVinck's life. 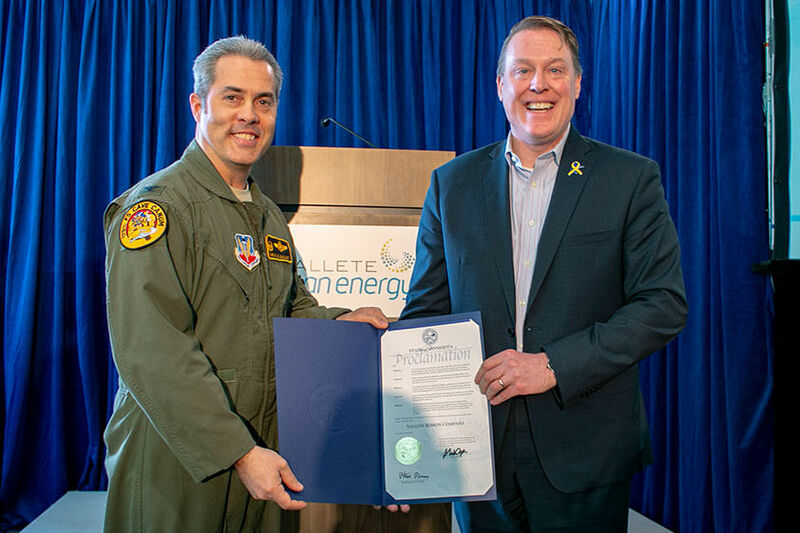 Col. Christopher Blomquist, commander of the 148th Fighter Wing based in Duluth, presents ALLETE Clean Energy President Al Rudeck with the Yellow Ribbon proclamation. As ALLETE Clean Energy received its official Yellow Ribbon proclamation from the state of Minnesota on Thursday, the Proctor Military Kids Club in the audience was a powerful and timely reminder of the Yellow Ribbon program’s purpose. About 75 people, including 29 members of the Proctor Military Kids Club, attended the morning ceremony April 5 in ACE’s sunny, newly renovated office space in Lake Superior Plaza. 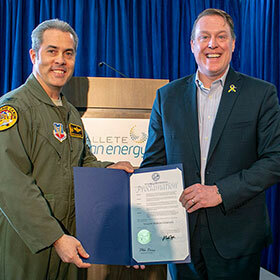 Col. Christopher Blomquist, commander of the Duluth-based 148th Fighter Wing of the Minnesota Air National Guard, presented the Yellow Ribbon proclamation to ACE President Al Rudeck. After accepting the proclamation, Rudeck said Minnesota, where the Yellow Ribbon program was conceived before spreading across the nation, is a leader in so many areas of society. 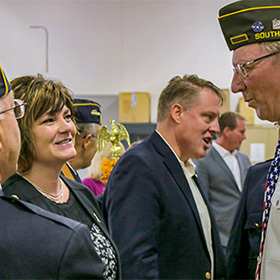 To earn a Yellow Ribbon designation from the Minnesota Department of Military Affairs, companies must build relationships with local military leaders, identify employees who have military connections and commit to hiring, supporting and retaining veterans. The designation recognizes companies that honor military-connected employees and their families, and streamline their access to resources. With operations in Pennsylvania, Minnesota, Iowa and North Dakota, and another to be added in Montana, Rudeck said ACE’s Yellow Ribbon designation will transcend Minnesota. “We’ll carry the same policies, positions, commitment and values forward in every part of our operations,” he said. That includes maintaining pay and benefits for employees who are deployed and supporting their families at home. “We hope that is one or two things we can do to reduce the stress factor,” he said. He then turned to the Proctor Military Kids Club, which celebrated the Month of the Military Child earlier this week, saying they are developing innovative programming to help kids manage the stress that comes with a parent’s deployment, and presented the club with a $2,000 check that highlighted the company’s commitment to Yellow Ribbon values. “We’re really excited that we can help them today with all that goes on in kids’ lives and parents’ lives during a deployment,” he said. Before the presentation of the Yellow Ribbon proclamation, Andrew Grace, a six-year Army veteran, wind technician at ACE’s Armenia Mountain wind facility in Pennsylvania and a member of the Yellow Ribbon recruiting subcommittee, said the program’s broad focus has an amazing reach, and he’s been honored to take part in it. “I greatly appreciate the Yellow Ribbon program as a whole, and I truly never imagined working for a company that has such devotion to its military-connected employees and families,” he said. Also speaking at the event were ALLETE Chairman, President and CEO Al Hodnik and Duluth Mayor Emily Larson. Cindy Schubitzke, ACE regulatory compliance adviser, was master of ceremonies at the event and introduced the speakers. The colors were presented by the University of Minnesota Duluth ROTC Color Guard. Brad Oachs presents Shelley Valentini with a ceremonial key to the new United Way building in Chisholm. When one door closes another opens. That old saying is true in Chisholm, where a former Minnesota Power service center is now home to United Way of Northeastern Minnesota. A $400,000 company contribution from Minnesota Power helped the nonprofit buy the facility. Employees and retirees across ALLETE, ALLETE Clean Energy, Minnesota Power, BNI Energy and Superior Water, Light & Power have pledged to give almost $306,000 to United Way in 2018, largely through payroll deductions. The Minnesota Power Foundation contributed an additional $250,000. Combined with other corporate gifts and money raised through special fundraising events, the ALLETE family’s total United Way pledges and contributions during the latest campaign exceeded $580,000! The money will go to 15 United Ways in Minnesota, Wisconsin, Iowa, North Dakota, Oregon and Pennsylvania. This phenomenal success is possible because passionate employees make it fun and attractive to participate in United Way with events such as carnivals, pancake breakfasts, ice cream socials and silent auctions to raise awareness and additional funds. Throughout the year, many also volunteer for United Way Day of Caring and Day of Action events, personally connecting with agencies and organizations supported by their contributions. These hands-on experiences might range from beach cleaning to painting at a homeless shelter to assembling care packages for the disadvantaged. What they share is individual and corporate commitment to “Living United” and giving where you live. (Top) The Minnesota Power Foundation presented a $25,000 check to Hibbing Public Schools. 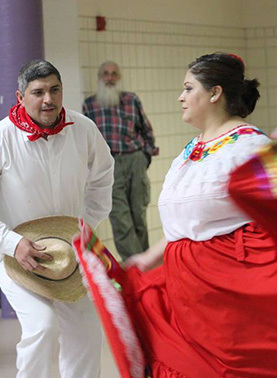 (Right) In 2017, investments helped fund community theater in Backus and a celebration of Mexican culture in Long Prairie. Hibbing High School’s ornate auditorium is legendary on the Iron Range—both for its elegance and its historic significance. Built in 1924 and modeled after the Capitol Theatre in New York, the performance hall features molded ceilings, imported glass chandeliers and many other notable design elements. Its stage has hosted John F. Kennedy, the Boston Pops and a young Robert Zimmerman, who made his debut there in a high school talent show long before the world had heard of Bob Dylan. Now the facility is undergoing a full restoration with help from the Minnesota Power Foundation. 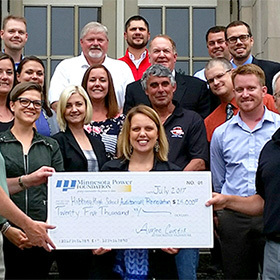 The Minnesota Power Foundation and a group of Minnesota Power employees with ties to Hibbing presented high school officials with a check for $25,000 in 2017. The money will go toward a $3.15 million effort to paint the auditorium, restore its murals and historic detailing, refurbish the seats and improve accessibility. District officials hope to complete the renovation by October 2018. Arts and culture are vital to the fabric of society. The Minnesota Power Foundation and its associated ALLETE companies work throughout the year to advance and preserve them through grants, corporate donations and sponsorships. In 2017, these investments helped fund community theater in Backus, an orchestra and string program in Itasca County, a celebration of Mexican folk dance and cuisine in Long Prairie, and a wide variety of concerts, theatrical performances and programs that expose people of all ages and means to the beauty of creative and cultural expression. (Top) Drivers go over travel plans before departing Duluth on Christmas Day with equipment headed for Alabama. It was later shipped by barge to Puerto Rico. 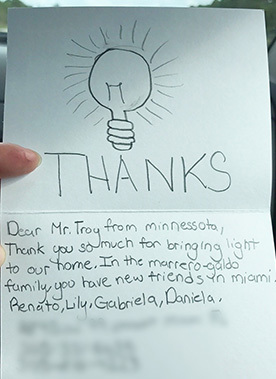 (Right) Many grateful Florida residents, including Merrero-Galdo family, sent thank-you notes and posed with lineworkers after power was restore to their homes. The first blows came in late August when Hurricane Harvey (later Tropical Storm Harvey) made multiple landfalls in Texas and Louisiana, dropping 50 inches of rain in some areas. Employees of U.S. Water, an ALLETE company, were among thousands affected. U.S. Water donated $10,000 to relief efforts, and the Minnesota Power Foundation contributed $10 for every ALLETE company employee who donated to the Red Cross, raising a combined $15,000 for Hurricane Harvey relief. As Minnesota Power and SWL&P crews prepared to respond, Hurricane Irma roared through the Caribbean and Florida Keys, leaving millions of additional people without power. 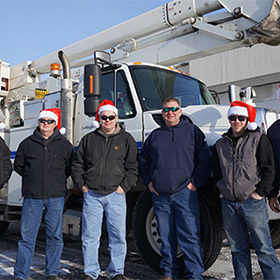 Florida Power & Light (FPL) requested backup through the Midwest Mutual Aid Group, and the northern Minnesota and Wisconsin utilities sprang into action—sending 31 lineworkers, underground cable splicers and support staff, plus equipment, to Florida. Crews battled heat and humidity to restore power, earning the respect and appreciation of their peers and Florida residents. U.S. Water, which has employees in Florida, as well, donated another $10,000 to the Red Cross for Hurricane Irma relief. Northland crews were about to head home when Hurricane Maria slammed into Puerto Rico on Sept. 20. That catastrophic storm on the heels of Hurricane Irma killed hundreds of people and destroyed the U.S. territory’s electric grid, which already had severe damage. Months later, much of the island remained without power. In late November, two members of Minnesota Power’s logistics team, Stephanie Olson and Becky Moore, traveled to Puerto Rico to support power restoration efforts. Both worked on emergency response logistics during the July 2016 wind-storm that devastated parts of Duluth, and they put that experience to work. As 2017 ended, a fleet of Minnesota Power and SWL&P vehicles was headed to Puerto Rico in the first wave of a coordinated industry response. Personnel were preparing to follow. Duluth residents saw the value of mutual aid after the 2016 wind-storm. Hopefully, the people, expertise and equipment sent to Puerto Rico will speed the island’s recovery in 2018. 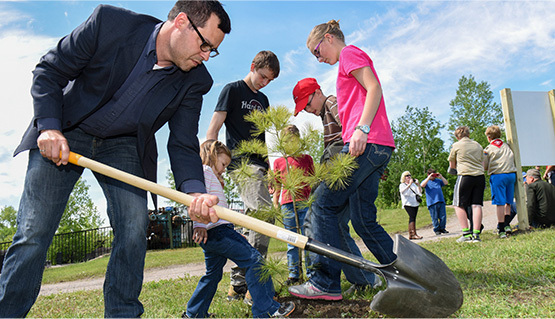 (Top) Jack Rajala, Al Hodnik, and Birch Grove students and faculty pose with white pine seedlings. (Right) About 70 DNR supervisors from across MN were at Boulder Lake Environmental Learning Center to learn more about Rajala Woods. Hearty employees braved the cold to "bud cap" white pine seedlings at Hartley Nature Center in Duluth. 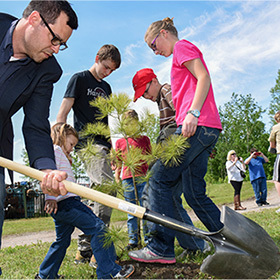 Most Boy Scouts are familiar with a quote attributed to their organization’s founder, “Leave this world a little better than you found it.” Members of Troop 65 in Little Falls put that saying into practice in May 2017, helping Minnesota Power representatives and city officials plant 750 red and white pine seedlings at Mill Park and other local sites. The planting was part of Minnesota Power’s Rajala Woods forest legacy initiative, an effort launched in 2015 to plant 3 million long-lived conifer seedlings in central and northeastern Minnesota over 10 years. It was named after the late Jack Rajala, a forest products businessman, conservationist and longtime ALLETE board member. Similar activities occurred throughout the year on company-owned land, including sites around Minnesota Power’s reservoir lakes that were damaged by severe windstorms in 2016. 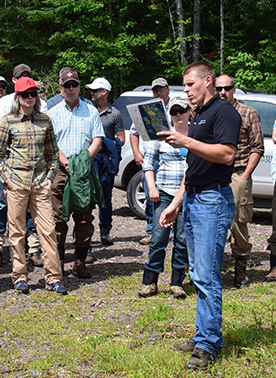 About 70 forestry supervisors from the Minnesota Department of Natural Resources visited the Boulder Lake Environmental Learning Center in August 2017 to see a nearby Rajala Woods site and learn about Minnesota Power’s commitment to sustainable forest management. John Rajala, son of the initiative’s namesake, was among those at the field day. He noted how Rajala Woods can inspire public agencies and private landowners to care for the forest and promote forest health, quality and productivity. Since the initiative began in 2015, close to 700,000 trees have been planted on land owned by Minnesota Power and other select sites. In fall of 2017, a new seed was planted with formal establishment of the Rajala Woods Foundation. This tax-exempt nonprofit organization will acquire and manage ecologically significant forest acreage with a goal of increasing the amount of longer-lived conifer trees, like white pine, in northern forests. Its forest management efforts will deliver numerous environmental benefits, provide access for public recreation, and help support forest resiliency and productivity. The Rajala Woods Foundation is committed to partnering with like-minded agencies, organizations, groups and individuals to advance and sustain our forest management goals. (Top) Cindy Schubitzke visits with Lake Benton wind technician Rick Nase during ALLETE Clean Energy's ESGR signing event in Nov. 2017. (Right) The Minnesota Power Foundation donated $2,000 to the Minnesota Assistance Council for Veterans. Teams of employees braved the cold temperatures to raise $5,000 for 23rd Veteran during Duluth's Nearly Naked Ruck March. Balancing military service with a civilian job is not easy, but a supportive employer can make a big difference. ALLETE Clean Energy earned Yellow Ribbon status in 2017, distinguishing itself as a company that honors military-connected employees and streamlines their access to resources. The designation is awarded by Beyond the Yellow Ribbon, a program overseen by the Minnesota Department of Military Affairs and a sister program to the U. S. Department of Defense’s Employer Support for the Guard and the Reserve (ESGR). To earn the title, companies must build relationships with local military leaders, identify employees with military connections and actively work to hire, support and retain veterans. 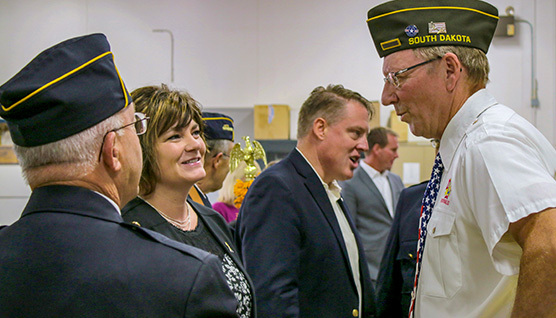 ALLETE and its subsidiaries have long supported employees with military connections and honored their service to country. Minnesota Power was named Duluth’s first Yellow Ribbon Company in 2016 and received the 2017 “Above and Beyond” award from ESGR in Minnesota. Recipients are nominated by employees who are members of the Minnesota National Guard and Reserve. Throughout the year, ALLETE companies and employees demonstrate their respect for military service. They raise money for veterans groups, support efforts that help soldiers reintegrate into civilian life and personally assist veterans in need. ALLETE’s Yellow Ribbon Steering Committee also helped four employees travel as guardians on Honor Flight Northland 2017 to Washington, D.C. These flights allow veterans of World War II, Vietnam and the Korean War to tour the nation’s capital and visit memorials that ensure their service and sacrifices will never be forgotten. 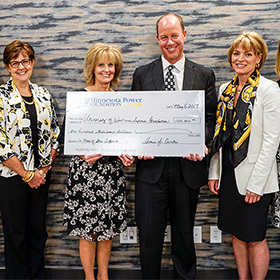 The Minnesota Power Foundation donated $100,000 to the University of Wisconsin-Superior Foundation in honor of UW-Superior alumnus and former ALLETE Chief Financial Officer Steve DeVinck (center). The University of Wisconsin-Superior has always been part of Steve DeVinck’s life. He grew up three blocks from campus and graduated from UW-Superior with a degree in accounting. He remained connected through a long career at ALLETE, sharing his financial savvy and leadership skills with the UW-Superior Foundation Board and linking students with company internships and jobs. 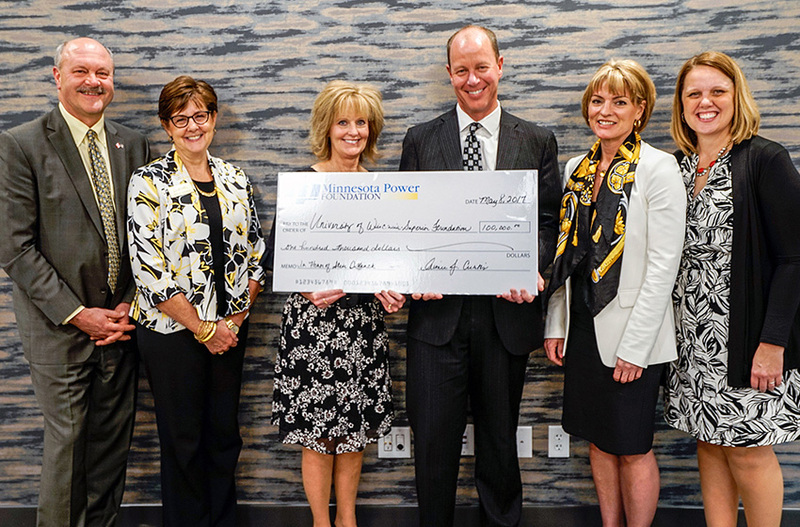 The Minnesota Power Foundation honored the former ALLETE chief financial officer, who retired in May 2017, with a $100,000 donation to UW-Superior. The gift will support the university’s priorities and strategic initiatives. UW-Superior has renamed its Yellowjacket North Atrium the Steve DeVinck North Atrium in appreciation. DeVinck is not the only employee recognized in 2017 for advancing higher education. Tom Donofrio, ALLETE director of project development and reporting, received the Swenson College of Science and Engineering Recognition Award for contributions that bring excellence and distinction to the engineering programs at UMD. ALLETE and its affiliates support education and cultivate a skilled, engaged future workforce in many ways. In the past 20 years, the Minnesota Power Foundation has awarded more than $2 million in academic scholarships, helping hundreds of area students. This includes 2017 recipients: 12 high school seniors who received $2,500 Community Involvement Scholarships and 15 college students pursuing degrees that match the region’s workforce needs who received $1,000 to $2,500 New Generation Scholarships. In addition to scholarships, the Minnesota Power Foundation fosters leadership and learning through education grants and sponsorships. For example, a 2017 grant sent student leaders at New Salem-Almont High School in North Dakota to a statewide convention for student councils. The Foundation consistently supports technology-based programs and events such as science fairs and FIRST Robotics competitions. Employees often participate by sharing their time and expertise. 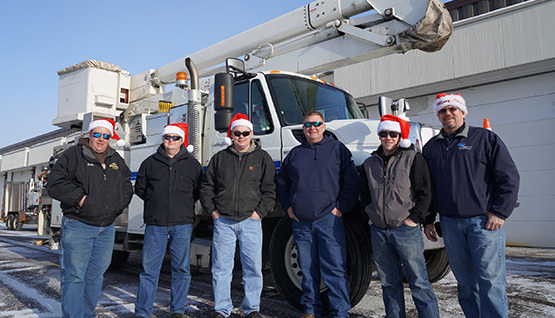 A Career Mentor Day at Minnesota Power’s Herbert Service Center gave lineworkers, technicians and engineers an opportunity to talk with high school students and demonstrate technical aspects of their work. Representatives of ALLETE Clean Energy’s Armenia Mountain wind farm in Pennsylvania and other ALLETE companies reinforce this message at career fairs in their communities. The future is positively powerful for those with the skills to succeed. Minnesota Power employee was honored Tuesday, March 27, 2018 along with the company for their support of the United Way of Northeastern Minnesota. Eric Clement, supervising engineer, received the Lifesaver Award for the time and dedication he gives to the organization. 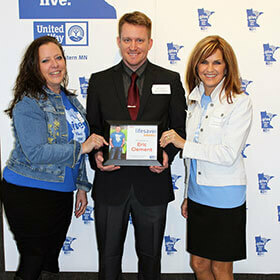 Minnesota Power received the Campaign Award for a 23 percent increase in employee giving to the UWNEMN. Both awards were announced at the organization’s 51st annual campaign celebration in Chisholm. Clement serves as UWNEMN second vice president and sits on a smaller group of board members that focuses on long-term strategy. For the past year he also has chaired the building committee guiding the renovation of MP’s former Chisholm Service Center into a new home for the UWNEMN. 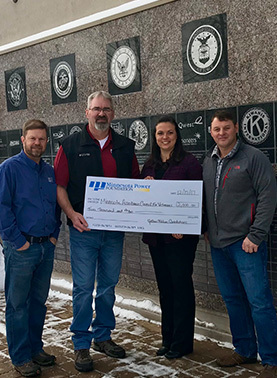 A $400,000 company contribution last year made it possible for the United Way to purchase the former service center, which Minnesota Power vacated in 2015 in an effort to improve efficiencies by moving employees to other locations. At times, managing its renovation into a building suitable for United Way programs has almost been like having a second job. But Clement is quick to note that he’s had a lot of support from the rest of the building committee and others, such as MP facilities manager Mike Polzin’s group, which is helping with some storage planning. “I can see the light at the end of the tunnel,” Clement said, adding that the United Way is on track to move into the remodeled building in early June. Clement, who lives near Eveleth, occasionally volunteered at various United Way events since joining Minnesota Power in 2004. But it was in 2015 while earning his MBA at the College of St. Scholastica in Duluth that he discovered his passion for the organization. Clement was invited to attend a UWNEMN board meeting after talking with others from the Iron Range who were at Scholastica to further their education during a downturn in the mining economy. “I was hooked from that point forward,” Clement said. He said he hadn’t really understood before how United Way worked and was impressed that it was a funding mechanism for so many different nonprofits. In addition to his United Way leadership work, Clement also participates in many of the organization’s activities, including the Buddy Backpack program, Taste of the North and Power of the Purse. One of his favorites is Rampage at the Ridge, a 5K obstacle course that raises money for veterans programs on the Iron Range. He helps set up the course, manage the race day, participates in the run, and then helps break it down. Receiving the Lifesaver Award is humbling, Clement said. 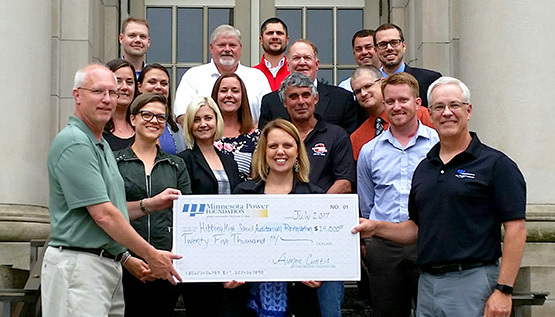 MP employees stepped up in a big way to help build stronger communities on the Iron Range and their efforts merited Campaign Award recognition. They pledged $52,478 of the total $2,085,367 raised in the 2017 campaign. United Way of Northeastern Minnesota serves individuals and families on the Iron Range (northern St. Louis County and eastern Itasca County) and in Koochiching County. (Top) Company volunteers pose with the Volunteer of the Year award. 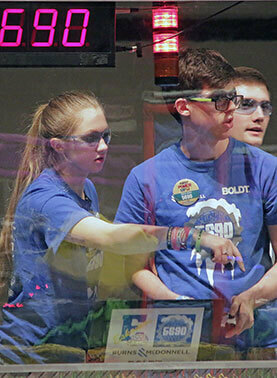 (Right) Members of the Esko SubZero robotics team watch and control their robot on the playing field. The main objective for teams was to place boxes on the teeter-totters to get the most time with the low end on their side. 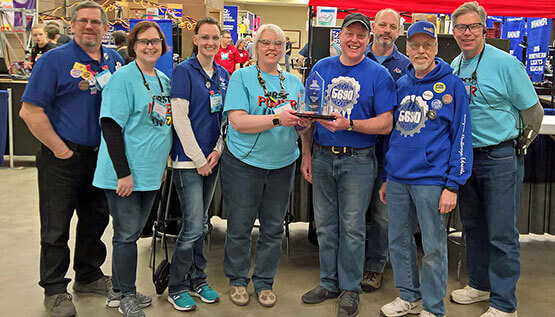 As 120 teams competed for robotics supremacy at two FIRST Robotics regional tournaments at the Duluth Entertainment Convention Center in March 2018, organizers of the events recognized Minnesota Power as the Volunteer of the Year. 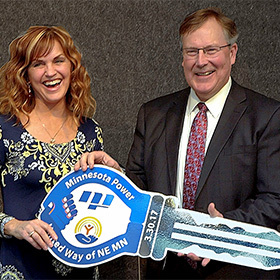 “We are so pleased and proud to present the 2018 Volunteer of the Year Award to the flagship sponsor of the Lake Superior Regional since its inception, Minnesota Power,” said Jay Dillon, who helps lead event organization with his wife, Chris. The award was presented at an awards session on Friday, March 9, 2018. Dillon said Minnesota Power provides money, a place to meet, volunteers, judges, printing and more to support FIRST Robotics. Again this year, a contingent of employees was among the more than 200 volunteers who helped ensure that the Lake Superior and Northern Lights regional competitions went smoothly. 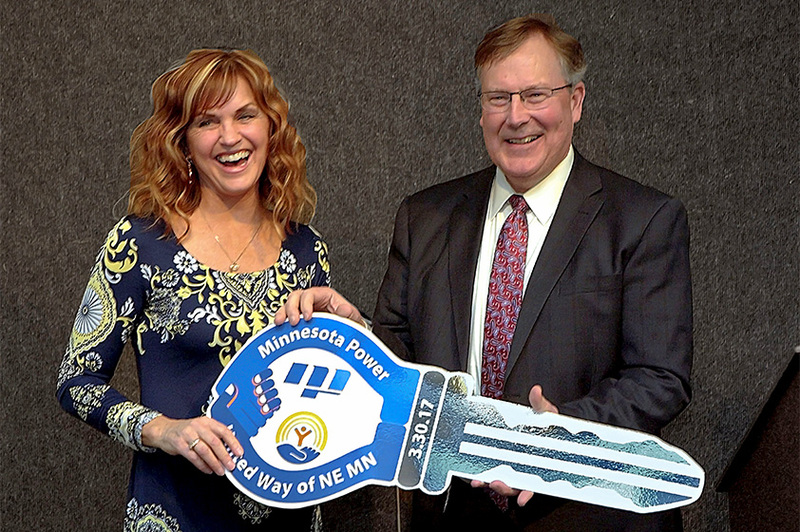 The Minnesota Power Foundation is a major sponsor of the two regional competitions and donates to a number of area FIRST teams. In addition to Frisk, volunteers and mentors at this year’s competitions included Jerry Frederick (mentor, Esko), Carol Walch (lead safety glasses adviser), Katherine Rasley (robot inspector and mentor, Duluth East), Brad Perrett (judge), Al Rudeck (mentor, Esko), Bill Peterson (judge), Chuck Kimball (pit announcer), Rachael Snyder-Cochran (judge assistant) Paul McDonald (mentor, Duluth East) and Linda McKeever (pit administration support). Frisk also was on hand to present the judges’ awards on behalf of the foundation. One team sponsored by the MP Foundation, the Duluth East Daredevils, won the Regional Chairman’s Award in the Northern Lights regional and qualified for the FIRST Robotics world championship in Detroit in late April. Other teams sponsored by the MP Foundation were Esko SubZero Robotics, Silver Bay Mariners Robotics, Hermantown Talons and the Chillbots from International Falls. Twenty-six teams from within MP’s service territory competed in the two regionals at the DECC, with five of them placing in the top 20 teams at the two competitions. The Carlton Doomsday Dogs team won the Rookie Inspiration of the Year award at the Lake Superior regional. Sherri Ohnstead, a mentor for the Marshall School’s Topper Bots team, won a mentoring award. In addition to teams from Minnesota and Wisconsin, the Vikings Robotics team from Vaxjo, Sweden, also competed in the Northern Lights regional. FIRST (For Inspiration and Recognition of Science and Technology) Robotics claims the competitions have a big impact on students, with 88 percent of participants showing more interest in school, 90 percent more likely to take a challenging math or science course and 90 percent more interested in attending college. Minnesota was the first state in the nation to have its state high school league recognize and endorse FIRST robotics as a sanctioned sport just like hockey, football or basketball.